Cement is a sequencer based pattern generator. It is designed to allow the user to create cementing textures, crawling patterns or a fundamental for your musical idea. Cement comes up with three layered instruments, which can create numerous sound colors. The instruments are: a sinus synth, a banjo combined with guitar harmonics and a music box. 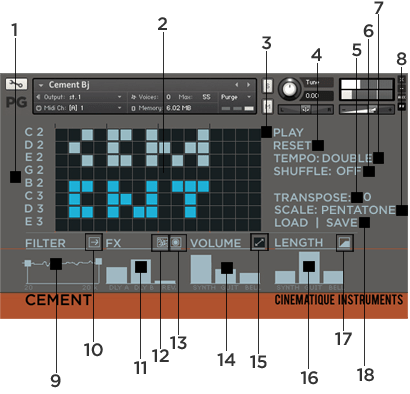 Cement provides several options to modify the sound: low-pass- and high-pass filter (with a random high pass modulator), distortion- and speaker switches, an alternate sinus sci-fi sound, separate length settings and separate slider to set the amount of two delays and a reverb. Geiger Counter is a sequencer based pattern generator. It is contrary to Cement a non-harmonic percussive module that is best suited to lend your music production a contemporary percussive color. You can easily create groovy patterns built out of bits, glitches and blips! Geiger Counter comes up with two different sound groups, which can create numerous sound colors: There are firstly six different sounds of bits, glitch and blips – available twice at two separate tracks and secondly six different noise samples. For modifying the character of your pattern, Geiger Counter provides plenty of options to change the sound to your very own requirements: lowpass- and highpass filter (with a random high- and highpass filter (with a random high- and low pass modulator), distortion-, lofi- and speaker switches, a cacophony (!) switch, separate fader to set the length and volume of all three tracks and separate slider to set the amount of two delays and a reverb.